NEW YORK (CNNMoney.com) -- If you want to buy an electric car today, good luck, it's slim pickins. But fast forward three years and you could be facing more plug-in choices than you'll know what to do with. That could be a problem for carmakers because most Americans still have little or no interest in buying electric cars. From General Motors (GM) to Honda, almost every major automaker -- and even some not-so-major ones -- plans to have at least one plug-in car on the market by the end of 2012. Toyota alone will have three, including the Rav4 EV SUV and the Prius plug-in. Meanwhile, start-up companies, many of which are betting their lives on plug-ins, are planning their own assortment of cars including: Wheego's Smart car look-alike, Fisker's sumptuous luxury liner and Aptera's three-wheeler that looks like a hastily reassembled Cessna. But despite all those new offerings, fewer than 7% of Americans say they would even consider buying a plug-in car according to a recent survey conducted by the automotive Web site Kelley Blue Book. Of those that may go electric, many are unlikely to double-up on risk by buying from an unknown company. Survival of the fittest (Or at least best-known): The big automakers shouldn't be badly hurt. First, they aren't totally reliant on plug-in cars. Far from it. Gasoline cars still make the vast majority of their sales and their profits. Second, big carmakers like GM, Nissan and Toyota will probably capture most of the plug-in sales. Electric car sales will mimic today's hybrid car market, where one model makes up half of all sales with the rest of the field left fighting over the scraps. While the Chevrolet Volt may sell in respectable numbers, Omotoso said , "the rest will sell a few hundreds or a few thousands." Companies like Georgia-based Wheego, which only makes one model right now -- the tiny Life electric car -- may struggle. The two-seat Life will cost about as much as the larger, better known, Nissan Leaf. Wheego chief executive Mike McQuarry insists he isn't terribly worried. Attention to customer service will set Wheego apart, he said. "If you email me, as the CEO, you're going to get a response back," he said. "I don't think [Nissan CEO] Carlos Ghosn can say that." Besides, Wheego doesn't need to sell as many cars as the big boys to stay afloat, he said. Aside from customer service, specialization is one key factor that may help some start-ups to make it, said Omotoso. Fisker Automotive, for example, has a good shot at making it because it's not challenging mainstream automakers, Omotoso said. 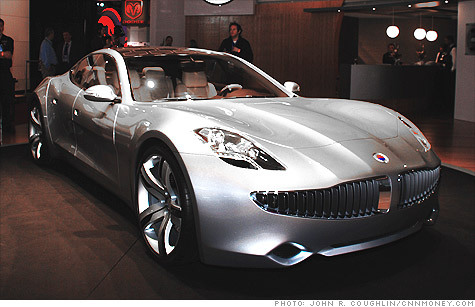 Its first product, the Fisker Karma, is a luxury sedan priced as an alternative to a Mercedes-Benz S-class or Jaguar XJ. Henrik Fisker, Fisker CEO and a former designer for BMW and Aston Martin, says he's confident in his company because he's able to make his product profitably even at low volumes and because the company's focus on green luxury makes it unique in the luxury car industry. Besides being electric, Fisker cars will be appointed with leather from free-range cattle and repurposed wood. Technology, a start-up's savior: Desirable technology is another key factor, said Omotoso. Carmakers can make money from licensing technology, not just from selling cars. "If you're a start-up, the key is to have some patents the big guys find valuable," he said. That's where California-based electric car start-up Coda Motors thinks it has an edge. Although the Coda sedan, priced at $37,000 after federal tax incentives, is slated to go on sale in late 2011 in California. Coda says other companies may also be interested in Coda's unique battery design. "We're a battery company, we're a car company but mostly we're a technology company," said Coda spokesman Forrest Beanum. That's an approach already working for Tesla Motors, which sells a high-priced electric sports cars, Omotoso said. Tesla has already partnered with Toyota and Daimler who are after its battery technology and expertise, he said. "Even if Tesla doesn't survive on its own, it may get bought by Toyota or Daimler," Omotoso said. For Tesla, the underlying technology is just part of its overall corporate strategy. With cars from Smart, Mercedes-Benz and Toyota using Tesla engineering, the world will benefit from more electric vehicles. "It speaks to Tesla's overall goal, which is just to put as many electric cars on the road as possible," said Tesla spokesperson Khobi Brooklyn. When pressed, she allows that, yes, Tesla also wants to make money. But she insists Tesla is really about green transportation, the more the better. Besides, the problem of too many cars isn't really a problem at all, insists Brian Wynn, president of the Electric Drive Transportation Association an industry group. "There's a great variety, which is important," he said. "We want to offer a great variety to see what gains traction in the marketplace." Can Marchionne build Jeeps cheaper in Italy? Back-up camera mandate for autos?